Relocation Centers When Japan attacked the United States at Pearl Harbor, followed by declarations of war by the Axis, enemy aliens became a concern. Spys on Hawaii had radioed fleet movements and weather conditions to Tokyo and were relayed to the Japanese attack fleet within minutes. From coded intercepts, the US government knew of spying activities were going on among recruited Japanese born and first generation Japanese-American. Where the names were known, the suspects were arrested and interned. For the general population of enemy aliens and their families, many with children born here, hence US citizens, the problem was greater. 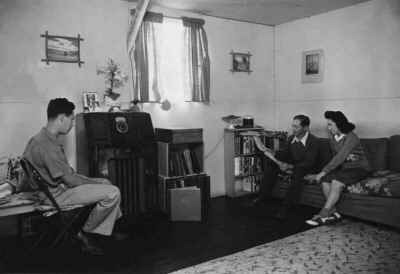 Restrictions were place on enemy aliens across the country -- curfews, travel bans, guns and shortwave radios made contraband. The east coast was not an invasion threat, but the West Coast was. Enemy aliens were banned from locations near military bases and defense plants -- some were forced to move. German, Italian, and Japanese interviewed by the FBI were offered voluntary relocation if they felt unsafe. As Japanese victory after victory mounted, the treat of attack on the west coast -- aircraft manufacture, shipping centers and principle naval bases with which to fight the Pacific War -- was a real danger. The population of enemy aliens, ie. Japanese citizenship, were asked to relocate away from the coast, outside of a 70 mile deep defense zone. 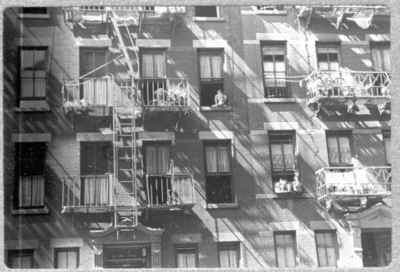 Although a few tried to relocate, they were met with rejection by the American public (vigilance committees at the Arizona boarder, etc.). Because the masses did not voluntarily move, they were given notice of escorted relocation. 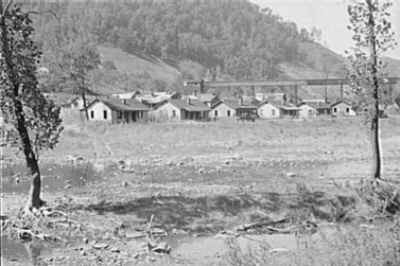 The initial move was to temporary locations while entirely new towns were built in secure locations -- militarily secure and secure from civilian violence as stories of Japanese army atrocities were circulated among the US population. 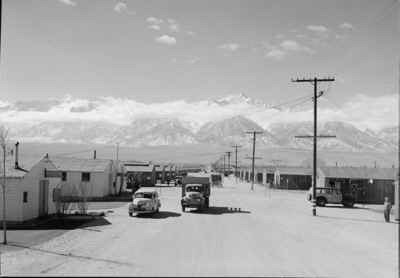 Enclosed are some photographs, most from the Ansel Adams collection of Mazamar relocation center that is within California, but over the mountains and away from the coast. 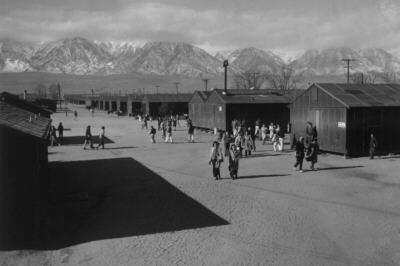 The relocated Japanese were held until the population could be classified. The people covered the full range of possible loyalties from Japanese citizens caught overseas by the war and expatriate loyalists who sent their children to Japan for proper schooling in loyalty to the Emperor, to fully integrated Americans who signed up for the Army. Relocation took a few months and sorting was completed in less than a year, about the same time that risk of invasion of the U.S. was eliminated. 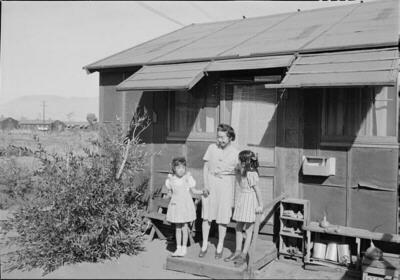 Most people were allowed to move to anywhere they were accepted by an American community. Those with family outside the exclusion zone quickly moved out. Others attended college or sought work, some returned rejected. The numbers that left slowly rose, but many stayed securely at the relocation centers until after the war ended. American Economy. Because it is easy to forget that conditions for the American public at the beginning of the War, we remind the reader that the entire world had gone through a Great Depression of poverty and hardship that brought dictatorships to power (FDR in the US was a kindly version) and ended in warfare in China and Europe. 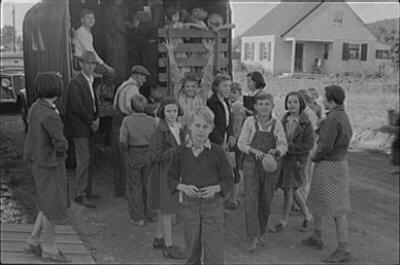 The depression in the American farm economy had begun in the 1920s and lasted two decades.. Commercial depression hit the urban economy in the 1930s and did not end until American factories started to receive orders from Europe for war supplies. Conditions of 1940 census found most people had indoor water supplies, indoor toilets were fewer ; cities and many rural areas had electricity, others used kerosene lighting ; everybody had radios, rural radios had storage batteries attached ; those families with jobs probably had telephones ; coal was the principle source of heat, air conditioning was virtually unknown ; successful farms had open tractors to replace some of the horses and mules ; paved roads meant at least gravel ; milk, bread. 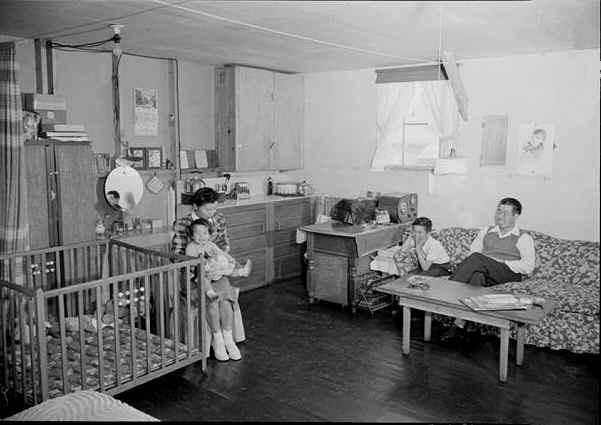 ice and doctor care were delivered to the door ; babies were commonly delivered at home ; so were funerals ; employment was proved for young men by the civil conservation corp ; young women were typists, store clerks, telephone operators, teachers or nurses ; motion pictures talked, in black and white ; B&W TV was still 10-years away. With the prosperity brought about by the GI Bill after the war, living conditions made rapid change. A drive through he country after the war saw the shacks of the 30s and 40s being replaced by a trailer during the 50s and then houses in the 60s and garages added in the 70s. 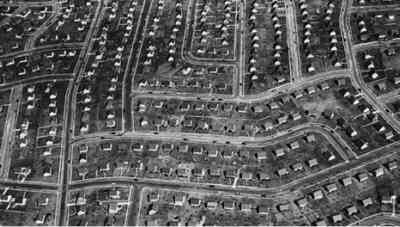 But a large part of the country lived during the war years in what we, today, would consider substandard housing for plumbing, electricity, insulation and space. 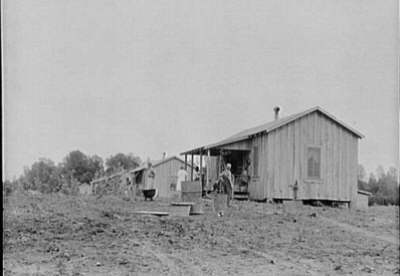 Standards The living conditions at the relocation centers were acceptable by the standards of the time. Enemy diplomats lived in resort hotels until returned to their home countries. 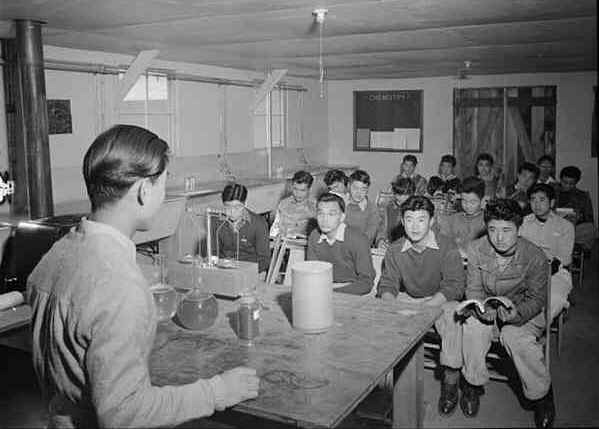 The conditions of relocation centers when presented to a modern audience as shamefully inadequate are judged by today's standards, 65 years later. 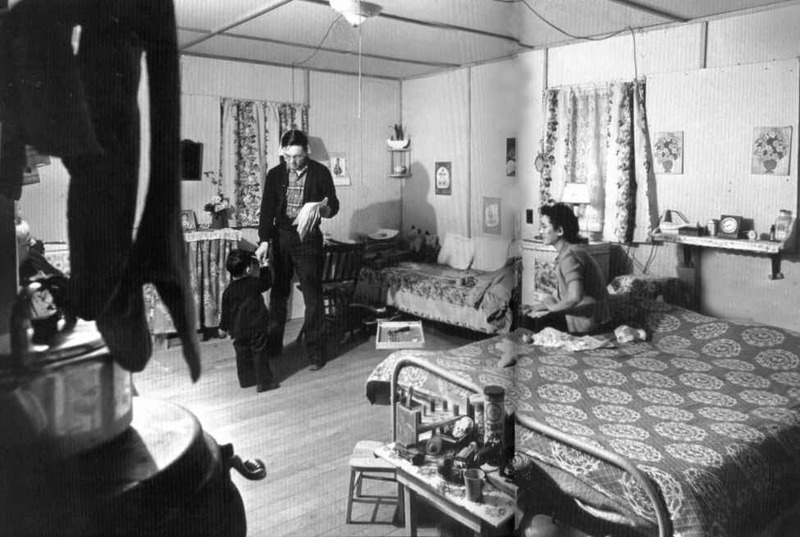 A comparative example from today might be housing provided to displaced persons after a natural disaster, perhaps mobile homes or "double-wides" with air conditioning and a wireless connection. 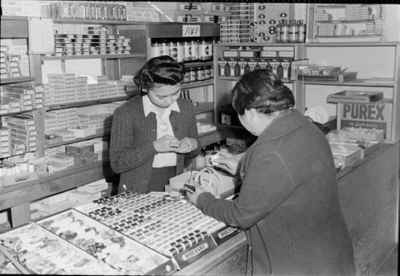 Masako Suzuki helps a customer with thread at the counter in cooperative store. High school students walking in road between buildings. 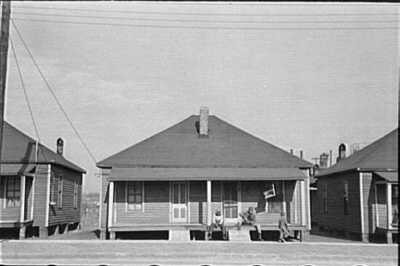 New cabins at Hill House, Mississippi.